If you've thought about donating mutual funds to charity, you'll be pleased to know that the Internal Revenue Service agrees that giving is a good thing. But you'll need to know more than just the positive impact of your donation. You should understand the tax implications as well. You can't assume that you'll receive a full federal tax deduction on the amount of your charitable donations of mutual funds. Although some taxpayers are able to deduct these gift to charity in full, others are limited. There are a few common reasons why the tax deduction of charitable gifts of mutual funds might be less than 100 percent. 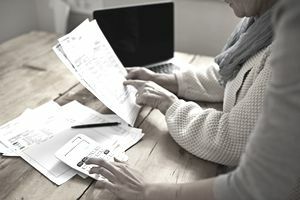 If you give away appreciated shares of your mutual fund to a qualifying charity but you held the shares for 12 months or less, your tax deduction will be limited to the amount you invested in the fund—or the adjusted cost basis if the cost basis is less than the full market value of the gift. The adjusted cost basis is the cost basis after taking into account things like capital distributions. You invested $1,500 in a mutual fund. Several months later the fund is worth $2,000. You gift the full value of $2,000 to your favorite charity 11 months after you purchase the fund. The tax deduction, assuming you meet some other qualifications, is limited to $1,500, the initial amount you invested. If you hold the shares for longer than 12 months, you might qualify to deduct the full market value of the gift for federal income tax purposes, albeit over a period of years. If you give shares of mutual funds that you held long-term—at least 12 months and one day—your tax deduction is limited to 30 percent of your adjusted gross income (AGI). If you gift mutual funds that you held short-term for 12 months or less, the ceiling on the deduction goes up to 50 percent of your AGI. And here's a bit of good news. If you face AGI limitations, you're allowed to carry forward the unused portion of the deduction for up to five years. That means you can deduct next year what you couldn't deduct this year, subject to the same rules. If you give shares of your mutual funds to charity and want to claim a tax deduction, you must itemize your deductions on Schedule A and submit the schedule with your 1040. You can't claim the standard deduction. This isn't advantageous for every taxpayer. You might find that the amount of the standard deduction to which you're entitled based on your filing status is actually greater than the total of all your itemized deductions. In this case, you'd end up paying the IRS more than you have to if you itemized instead. Keep in mind, too, that you can't simply give your mutual funds to your neighbor and expect to claim a tax deduction for your generosity. Only certain organizations are approved by the IRS to receive tax-deductible charitable donations. The IRS offers a searchable database of charities that qualify. Most well-known charities are eligible, like Goodwill or United Way, as well as religious institutions, nonprofit schools, healthcare facilities, and first responder organizations. But check the IRS to make sure that the charity you have in mind makes the list. You can enter the name of the charity and the IRS website will search for it and tell you whether it's qualified. Tax laws change frequently and individuals can be faced with differing income tax circumstances from year to year. Contact your tax preparer to determine if the above limitations and other limitations apply to your situation. Disclaimer: The information on this site is provided for discussion purposes only, and should not be misconstrued as tax advice or investment advice. Under no circumstances does this information represent a recommendation to buy or sell securities.